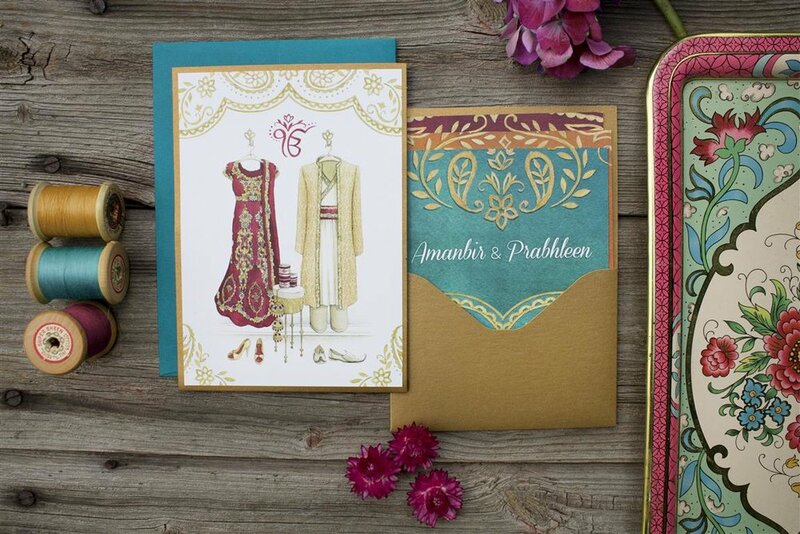 Bright and colourful, paisley Wedding Invitations and Stationery, fabulous for an Indian Wedding, especially! The wedding attire was custom painted for the couple, but I could replace that with your attire or even names and date for example! I’m a watercolour artist, so the artwork for each of my stationery designs has originally been hand-painted. After I scan the painting, I can use that artwork to design and create any coordinating pieces you need, from Save-the-dates to custom maps, place cards and signage. See below for an extensive list, but if it’s paper I can likely make it happen! All of my invitations and cards are DOUBLE-SIDED to showcase the artwork and text, while giving your guests a WOW factor!